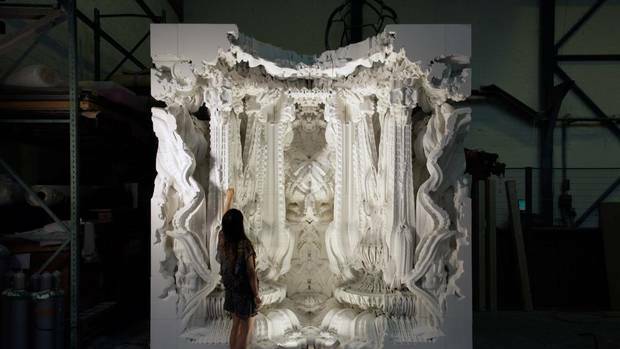 Benjamin Dillenburger created a room as intricate as one built over hundreds of years, in a matter of days. His tool? A 3-D printer. Below, I talked to the architect about pushing the boundaries of digital design and his dream of one day printing an entire house. The operatic curves of baroque architecture are enthralling to visitors of Europe’s 17th-century cathedrals, palaces and grottoes. But in a modern world obsessed with efficiency and expediency, enthralling isn’t good enough to justify the mountain-high price tag and years of manual labour required to erect such structures. Which is why Benjamin Dillenburger’s designs are so amazing.